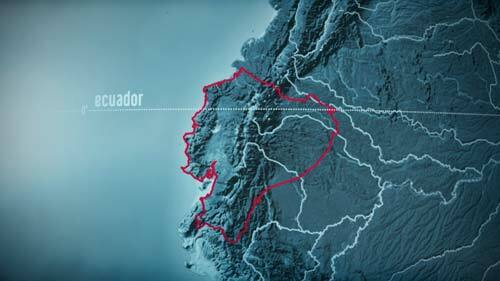 Ecuador is one of the smallest South American countries, yet one of the most diverse in the world. With 283.561 km2 (109,415 sq ml. ), it is one of those nations many people are hard-pressed to find on a map. Logically, however, and go by the title —Ecuador—, and know it´s in South America rather than Africa, you will find it rather quickly: as the name reveals, it lies on the equator, from which it takes its name. The only nations in South America through which the equator line runs, are Brasil, on the Atlantic shores, Colombia, to the north of Ecuador, and Perú, to the south and east. To the west of this “Andean” nation is the Pacific Ocean, and a thousand kilometers (roughly 700 miles) away from its coastline, the world-famous Galápagos Islands, which belong to Ecuador. Ecuador is one of the seventeen countries in the world considered to be “megadiverse”, that is, with more species per square kilometer than any other nation, harboring the majority of the plant and animal species of the entire planet. It was definitely the first country that officially declared, through its Constitution of 2008, that there are legally enforceable Rights of Nature. The four main regions are the Coastal Plains, which start at the base of the Andes all the way to the Pacific shores. The Highlands, also known as the Sierra, which is an area that runs from the north to the south of the country with two main Andes Cordilleras, which Alexander von Humbolt coined “The Avenue of the Volcanoes.” The Amazon Region or the Oriente, to the east, holds not only world records in biodiversity, but it’s also where most of the waters are gathered that feed the Amazon river. The Galapagos Islands are considered the fourth region, perhaps the best-known of Ecuador’s many protected areas. The first known settlements stem from over 11.000 years ago, the Ingas (nothing to do with Incas from Peru), which were located around the volcano Ilaló, just east of Quito. The native cultures from 4200 B.C. spread along the coast, have left many artifacts that can be found in museums and which rival some of the best collections of pre-colonial art. The Incas invaded from the south, from Peru, around the middle of the 15th Century, and ruled, mostly the Andean territories, for just about two generations before the Spanish arrived, in 1534. Colonial times lasted about 300 years until the independence in 1822, which led to the creation of one great nation: Gran Colombia. However, this period of one great nation made up of what today is Panama, Venezuela, Colombia, Ecuador, plus small parts of Costa Rica, Nicaragua, Peru, Brazil and Guyana, ended in 1830. The Republic of Ecuador began its days in an atmosphere of political intrigue, complex economic interests, leading to various revolutions in the 19th Century. As a country of great social and ethnic diversity, to agree on any given issue had always been a struggle, so the wealthy classes have for centuries managed to rule the region according to their own interests, leaving the native peoples in conditions similar to those they lived in during the colonial days. The Spanish had arrived looking for gold and riches, but Ecuador didn’t have the mines found in Peru and Bolivia, from which most of the gold and silver went to Europe, which was one of the main factors that allowed the beginning of the Industrial Age with an unprecedented “accumulation of capital.” This hidden economic history of exploitation from Europe through local ruling classes has been the order of the day, and without a look into its nature, it is hard to understand the present-day politics of countries like Ecuador, much less the rationale of its social as well as political revolutions swayed by a convoluted past. Without an understanding of where these interests stem from, who controls the economy, who has allowed even for certain laws to come into existence allowing for “corrupt ways,” it’s hard to comprehend the full meaning of a proposal like the one Ecuador is now making, that of leaving the oil in the ground and asking the world to be co-responsible for it. The truth of the matter is that over the centuries Ecuador —and much of Latin America— has been under the impression that the purpose and economics of the territory is to supply the first world with natural resources. That is, an “extractivist” economy has been the main source of income for countries like Ecuador, and its politics have always been ruled by the vision that this is the only way to do things. Either gold or silver, coffee or cacao, sugarcane or bananas, crude oil or now a potential combination of copper, uranium, natural gas and other newly-found mining resources, most of them in ecologically sensitive areas of ultra-high natural diversity, added to the new fad of “biofuels” as a means to acquire “renewable energy,” are threatening the country’s ecosystems and food sources in unprecedented ways.